Maggots, sweetcorn and worm catch roach, dace and bream. Lures attract and catch large predatory fish. 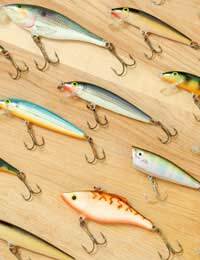 Lures are artificial bait made from wood, metal or plastic. They are shiny and brightly coloured. When retrieved through the water, lures rotate and vibrate and some even rattle! This movement, designed to imitate a vulnerable or injured fish, will tempt a hungry or curious predator to attack. Lures can be fished all year round and in deep or shallow water. It is an effective method for catching salmon and trout. For the coarse angler using lures pike and perch are the normal target, although sometimes chub will take the bait. Some lures can be a heavy piece of tackle and specialist lure fishermen will use a sturdy rod of about 3 metres in length. For the novice angler a slightly longer general-purpose rod is suitable. A fixed-spool reel is easy to operate and the best reel to cast a lure a long way. Fit the reel with line of about 12lbs breaking strain. If you are hunting large pike in lakes and reservoirs attach a trace wire on the end of the line. Pike are quite capable of launching a savage attack on the lure and trace wire will withstand the snap of sharp teeth. There are two general categories of lure: plugs and spinners. These are shaped like fish and have hooks attached. Plugs are designed to resemble prey of predatory fish. Plugs are very versatile lures. By altering the speed at which the handle on the reel is turned the plug will behave in a different manner. They can be made to dart and turn and sink and rise. This erratic movement perfectly matches the action of an injured or dying fish. Floating plugs are available and they can be used in shallow water for pike and chub. Turning the handle quickly will cause the floating plug to pop in the water encouraging a predatory fish to attack. For the angler new to plug fishing, the Devon minnow is a good choice. As the name suggests, the Devon minnow is shaped like a small fish and is popular bait for catching salmon. Spinners are made from bright coloured metal or plastic and hooks are attached to the end of the spinner. When it is reeled in, part of the spinner rotates and makes vibrations and this stimulates the predatory nature of certain fish. As with plugs, if the handle of the reel is turned at various speeds then the spinner will perform different actions. A recommended spinner to use is a small Mepps. When pulled through the water the flashing Mepps spinner is often irresistible to pike and trout. Choose a spot for lure fishing where the surrounding area is relatively clear of vegetation because this will make casting easier. On large waters, like lakes and reservoirs, start casting to your left then gradually work round in an arc. This method of casting ensures all fishing areas are covered. It is not always necessary to cast the lure great distances. If undisturbed, fish will feed close to the margins. Don't be in a rush to lift the lure from the water because fish often attack at the last possible moment. In dark or muddy waters, like ponds and canals, use a bright lure to reflect what little light there is. Invest in a pair of polarized glasses. Wearing these will enable you watch the lure in the water and maybe spot the monster accelerating to pounce! Can I fish wild brown trout in my local stream with a light-weight spinning rod, using small barbless Mepps and a few small barbless Minnow plugs in the month of April, May and June?